James D. Griffin | Parkowski, Guerke & Swayze, P.A. JAMES D. GRIFFIN, joined Parkowski, Guerke & Swayze, P.A., as an Associate in January 2017 after practicing with the firms of Tunnell & Raysor; James D. Griffin, Esquire; Griffin & Hackett, P.A. and Griffin and Robertson, P.A. since 1971. He practices in all of the Delaware courts on issues dealing with commercial law, wills, trusts and estates, eminent domain, real estate law and closings, public utilities law and education law. He practices in the Rehoboth Beach office. Mr. Griffin is admitted to practice in Delaware, the U. S. District Court for Delaware, the Third Circuit Court of Appeals and the U. S. Supreme Court. He is a member of the Delaware State Bar Association. After graduating from the University of Arkansas (B.S. in 1962) he served as an officer in the United States Marine Corp until 1965. 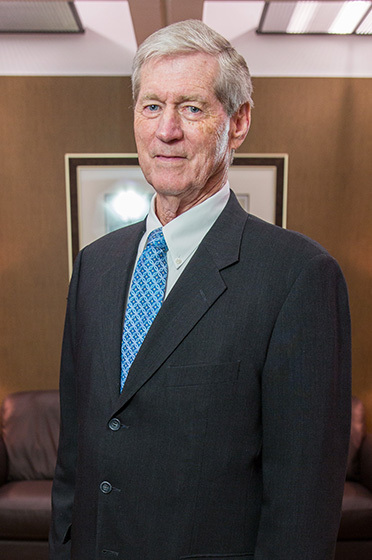 He attended the University of New Mexico School of Law and was awarded a Juris Doctor degree in 1969. He was admitted to practice law in Delaware in December 1969. Representative clients include Woodbridge School District, Delaware Dept. of Transportation, Key Properties Group, LLC; Country Life Homes, Inc.; and Sussex Shores Water Company.